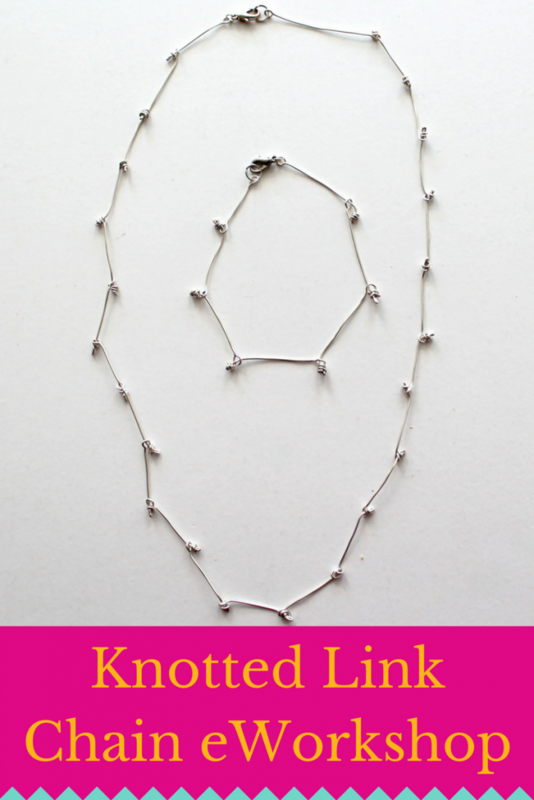 Welcome to the Knotted Link Chain eWorkshop! This chain is a lot of fun. It’s lovely and dainty, but also really unique. You can use the chain for necklaces, bracelets or anklets of any length. If you need assistance with anything – including anything technical, scroll to the bottom of this page for helpful hints and then contact me if those hints don’t help! There are instructions for downloading the PDF and Videos there as well. The PDF, the video and the step-by-step photos below all are the same tutorial. You can download and save the video and PDF (see below for help). *Wire: You may use any metal you prefer. I suggest 20 gauge because it’s thick enough to be sturdy, but still able to be bent relatively easily. You can experiment with other gauges if you like, of course. I use ParaWire, which is a silver plated wire that’s non tarnish. If you’re using ParaWire or a craft or some other coated copper wire you may find that there isn’t a hardness marking. In my experience most of these wires are pretty similar to half-hard and will work for this project. I highly recommend using a less expensive wire (not silver) while you’re learning and practicing. In order to keep all of our loops the same size throughout the project, I recommend using a sharpie marker and making a mark on your round nose pliers. Throughout the project you’ll line your wire up on that mark thus making your loops uniform. It doesn’t particularly matter where you make the mark, just that you use it consistently throughout the project. In this case I would suggest making the mark somewhat close to the tip to make a relatively small loop. Cut 3 inches of wire and make sure each end is flush cut. To make a flush cut use the back of the wire cutters (the flatter side that is not concave) toward the work. Now we’ll make a loop on one end. Hold the wire in round nose pliers. Line up the wire with the mark you made in Step #1. The wire should be at the top of the pliers, but not poking through the top. Twist your wrist holding the pliers away from you as you wrap the wire around the pliers. Twist as far as your wrist will allow. Then readjust your pliers and wrist, making sure to line up the wire with the mark you made, and twist away again completing the loop. About an inch from the end bend the wire and then push in the wire so it’s close. Use your crimp tool (some people call these crimp pliers) to push the bend in. Hold the bend part of the wire in chain nose pliers and bend up the shorter end of the wire making a little notch. This part can get a little tricky and difficult because you’re trying to wrap the end, but also hold it by the very tip. Sometimes your wire will start to harden and you’ll just have to cut off the extra little bit at the end. In other cases you can keep wrapping until you run out of wire. If you cut off the end, make sure to make a flush cut. In either case, use your chain nose pliers to make sure the end is not poking out. Cut off another piece of wire to 3 inches. This time start by making a knot on one end using Steps #4, #5 and #6 above. Slide the wire through the loop of the previous link. Then make a loop like in Step #3 on the other end. Then continue Steps #7 and #8 to continue to add links to your chain until it is your desired length. 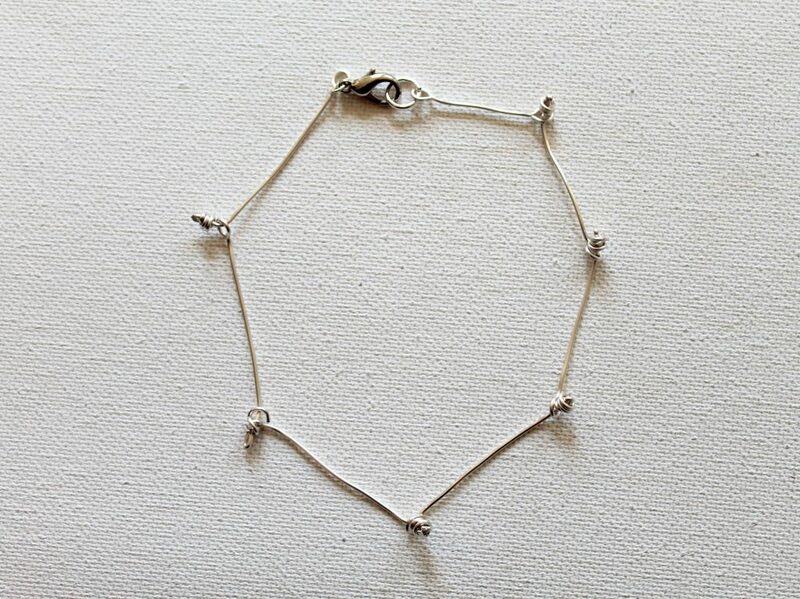 Tip: Stop one link before it’s the perfect length because we’ll add one more link to finish the chain. 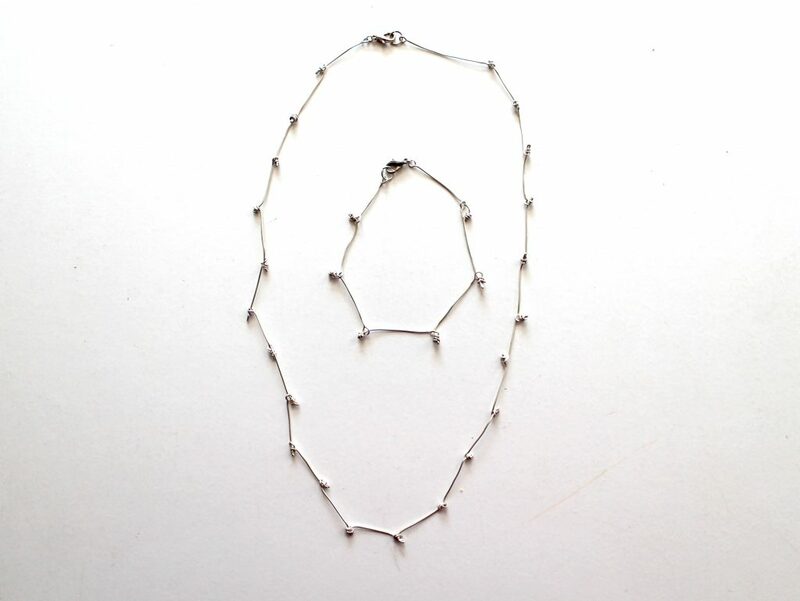 You’ll notice that the chain is kind of jagged and would be difficult to wear. So we’re going to bend each link so that it lies flat. Simply go link by link and bend up the end of the wire right by the knot. The chain has a loop at one end and a knot at the other end. We need to add another link to the knot end so that we can attach a clasp. 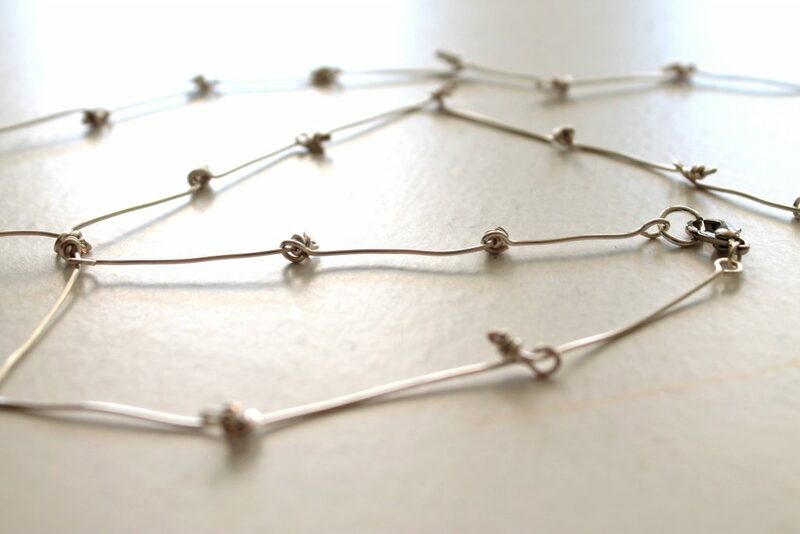 Cut another piece of wire and create a loop on each side just like you’ve been making loops all along in this project. Note: You can make this link the same length as all the other links or change the size so can make your chain fit perfectly. Open one of the loops just like you would open a jump ring. Don’t pull out to the side, but pull towards you. The loop will stay a circle, but be open. Then place knot from the last link in and close the loop the opposite of how you opened it. 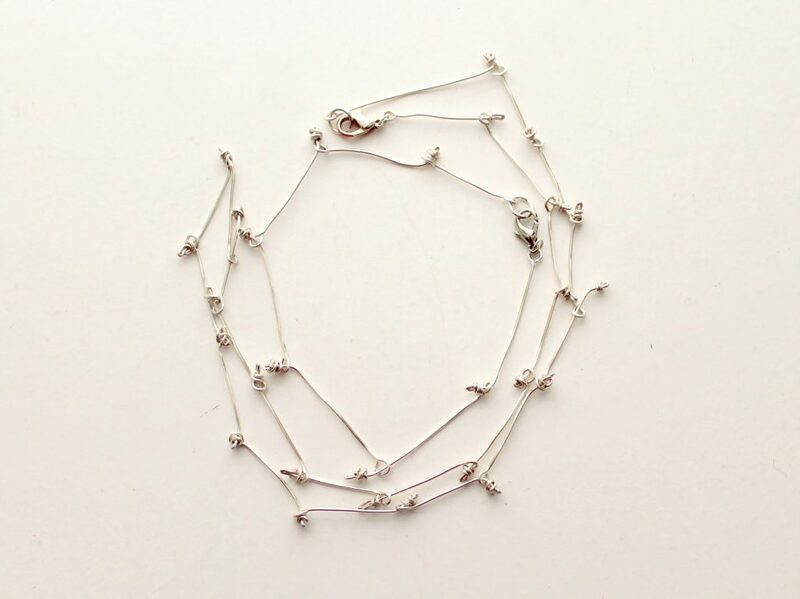 Now you can make a necklace, bracelet and/or anklet! You can leave a comment below (in the box that says “reply”) and even upload a photo! You can watch the videos right here on this page or open them in vimeo and even download it. Note: the jump ring video cannot be downloaded unfortunately. To download videos: click play and then click on the “vimeo” on the lower right hand side. That will open up the video in Vimeo and you’ll see an option to download the video there. NOTE: The PDF on this page is the same PDF you received when you purchased this eWorkshop. You can click to open it and then download it to your computer. You can also right click and then click “save as” and then save it to your computer. If you’re confused or stuck in any way, I am here to help. Send an email to Kim@KimberlieKohler.com with “Workshop Help” in the subject line so I find it quickly and can get back to you right away. You can also leave comments here on this page, too, if you have questions, too. Your question may be the same as someone else’s and I can help everybody by answering here. Just type a comment in the box that says “Reply” below. Note: your classmates will be able to see that comment. I have a new Customers Only Newsletter that has special perks only to you, my valued customer! This is different from my regular weekly newsletter and has special advantages like giving your input for new classes and workshops, checking out new items first, special deals and other surprise perks. You’ll get emails from me every 2 weeks or so when you sign up. I know there is a lot of information on this page. I really want to know how I can serve you better. The customer newsletter is way that I feel like I can serve you. Now, I have a favor to ask you. Would you please fill out this Feedback Form to let me know how you liked this eWorkshop? A big super THANK YOU!! (c) 2017 Kimberlie Kohler | All rights reserved. You do not have my permission to teach this tutorial in workshops or in any other way without my express written permission. You may use any piece of jewelry you make from this eWorkshop in any way you wish: personal use, gifts, or even selling for a profit. I appreciate credit for the idea, but it’s not necessary. Learn to make beautiful, sturdy, professional level wire wrapped jewelry! 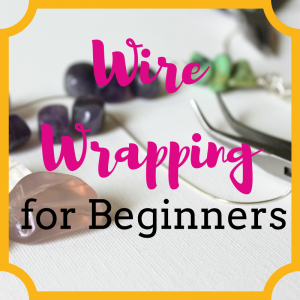 I show you how, step-by-step, in Wire Wrapping for Beginners eCourse! Learn all the components and techniques you need to make earrings, bracelets, charm bracelets, necklaces and rings! Plus be inspired to express your own creativity, going beyond just following step-by-step tutorials, but infusing your own style into the pieces. Such a sweet person. Takes time to help someone else. That’s rare.